" NEW LOOK NEW SEASON "
ITS' OVER. 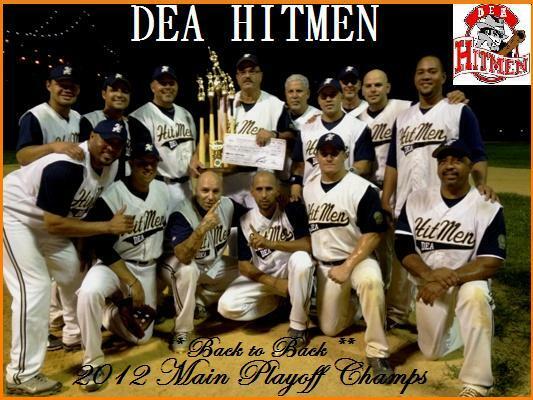 CONGRATULATIONS TO THE DEA HITMEN ON THEIR BACK to BACK CHAMPIONSHIP WIN AND BEING THE ONLY TEAM IN LOB TO WIN 2X AND REPEAT. SPECIAL SHOUT OUT TO TEAM LAFAMILIA WHO BATTLED THE ENTIRE SERIES, BUT HONESTLY, BOTH TEAMS WERE TRUE CHAMPIONS. TO SAY THE 2012 QLSA 5th ANNIVERSARY SEASON WAS ANYTHING BUT EXCITING WOULD BE A FLASE STATEMENT. 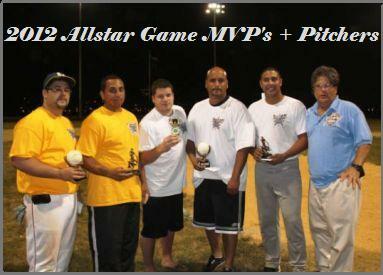 THE ALLSTAR GAME AND HOME RUN DERBY AS WELL AS THE INTER LEAGUE COMMISSIONERS ALLSTAR GAME WAS ALL A SUCCESS. 11 CASH PRIZES HAVE ALREADY BEEN PAID OUT AND HARDWARE HAS MADE ITS WAY TO 5 TEAMS ALREADY. THE CONSOLATION PLAYOFFS HAVE FOUR SERIES LEFT AND BEFORE YOU KNOW IT, FALL BALL WILL BE HERE. 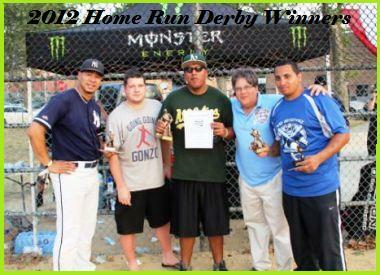 MORE INFO INCLUDING BOX SCORES AND LOTS OF PICTURES OF ALL THE MONEY WINNERS ARE COMING SOON. 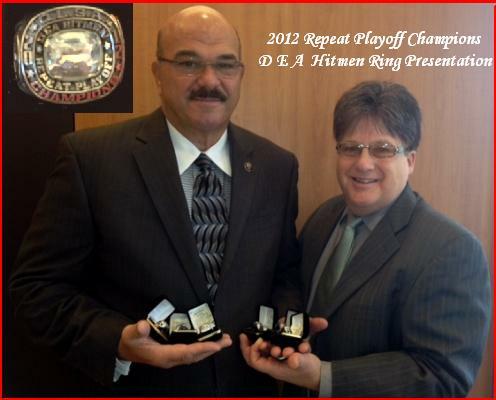 Both Commissioners tried desperately to get this game in last year, only to have mother nature the winner back in August 2011 (as a makeup date could not be agreed upon). So both Commissioners waited till this year for the 1st Annual Commissioners game. It appeared as Friday the 10th started, that the game would be rained out again, but after heavy AM thunderstorms, the weather settled and QLSA Commish (RT Ritchie) picture on the right, made some timely calls to get the field playable. Maybe he should have never gotten the field fixed for play, as the REDNMF Allstars took advantage of the "8 man QLSA Allstar" which showed and included Ritchie who played 1st base and pitched the final four frames in relief, winning 18-11. 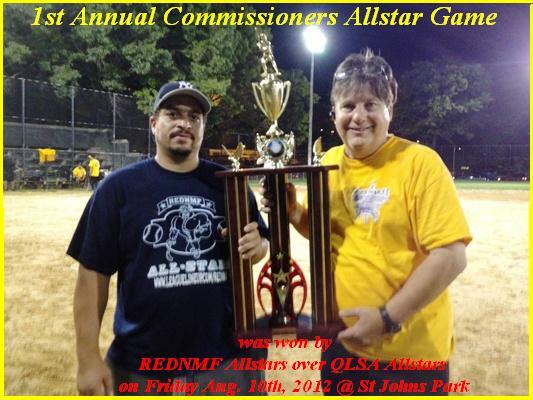 So REDNMF has bragging rights and gets to retain (Commish RED with the trophy pictured on the left) the "Commissioners Three Legged Trophy" thru 2012 and into 2013, till the next game is played next August. So the cry in the air is "wait till next year" when the QLSA will get a chance to take the trophy from REDNMF. Fridays game was played under the lights under QLSA rules. The 2013 game will be under REDNMF rules and will probably be a Sunday morning or afternoon game. Each league supplied an umpire and Red supplied the balls as Ritchie bought the trophy and had the field fixed. The QLSA was graced with the presence of "Mick the Quick" (Former New York Yankee Center Fielder - Mickey Rivers) who coached a bit for the Cardinals at 1st & 3rd during their split. Seems Mickey has a few friends on the Cardinals and they requested he appear in their team picture. (Click on Cardinals to see him with the team) It was great seeing him, as it brought back some great Yankee memories with his involvement in and participation in NY Yankee World Series Championships. Mickey was cordial to all, signing a few autographs and posing for some pics. "Hats of to Mr. Rivers, who still shows he is a class act and many thanks for making this night even more memorable". WELL AS ANTICIPATED, AFTER ANOTHER HIGHLY SUCCESSFUL SEASON, ORIGINALLY STARTING WITH 9 TEAMS IN 2008 TO 16 IN 2009, 22 IN 2010, 20 IN 2011 & 21 IN 2012 AS WELL AS ADDING A SNOFLAKE PROGRAM WITH 8 TEAMS IN THE FALL OF 2011 & NOW 14 FOR for 2012, ANOTHER SEASON, FULL OF EXCITEMENT & FAIR PLAY IS GETTING CLOSER TO A CLOSE ONCE AGAIN. ALL FIVE SEASONS HAVE BEEN GREAT, WITH EACH YEAR GETTING BETTER & BETTER. SO IF YOU ARE INTERESTED IN BEING PART OF THE PROGRAM IN THE FUTURE, COMPLETE AN ONLINE LINE TEAM REGISTRATION FORM IMMEDIATELY FOR THE 2013 SEASON, TO BE PLACED HIGH ON THE WAITING LIST OR FOR FALL PROGRAM INTEREST!!! Contact Gary (917) 856-6891 for more information. NEW TEAMS AND RETURNEES, INDIVIDUAL PLAYERS LOOKING FOR A TEAM AND UMPIRES ARE ENCOURAGED TO REGISTER ONLINE ASAP (complete proper form located in the upper RHS of this page) TO BE PART OF OUR PROGRAM. 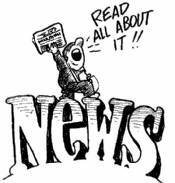 EXTRA,EXTRA READ ALL ABOUT IT: EMPIRE SOFTBALL ASSOC HAS A "NEW LOOK & NAME"
(for more info click on the above news icon) The Empire Softball Association (established in 1995) has changed its' name to the Queens Lighted Softball Association in an attempt to attract new players & teams interested in playing Lob Pitch (instead of Arc Ball) Double Headers on Dirt or Turf, under the lights at Queensbridge Field #1 (Under the 59th Street Bridge) and Whitey Ford (1st St & 26th Ave) both in Astoria - LIC, NY, between the hours of 8PM - 10PM on Mondays, Tuesdays, Wednesdays & Thursdays. 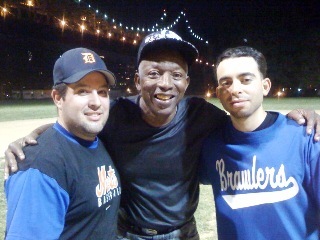 Fridays games are played @ St Johns Park (Brooklyn) and Harlem River Drive (128th St & 3rd Ave).